King Arthur Pendragon RPG | Tales to Astound! As I’ve noted elsewhere King Arthur Pendragon is one of my favorite roleplaying games ever. I first encountered it in the 3rd edition and was blown away by the mechanics, the layout, and Lisa Free’s gorgeous art. James Maliszewski wrote a lovely tribute to the 1st edition back in 2010. And lo and behold, DriveThruRPG currently has a PDF of the 1st edition available for FREE until January 31st, 2017. All the contents of the original game are included in a single PDF. While the editions haven’t changed that much over the years (apart from the 4th edition which added magic and expanded the “classes” of characters from knights to many other folks) I’m curious to see how the original version of the game reads. Chivalric Roleplaying in Arthur’s Britain. Relive the glory of King Arthur’s court. Uphold the chivalric ideals of fair play, courage, honesty, and justice as your caliant knight-character undertakes perilous quests and risks monstrous dangers in legendary Britain. He’ll smite bloodthirsty giants and crush treacherous invaders for King Arthur and his own glory. Roleplaying – innovative game mechanics awaken passionate love, hate, and loyalty in your characters, leading them to acts of mercy, cruelty, lust, piety, valor, and cowardice. Campaign Play – customs, manners, and weapons change during teh phases of Arthur’s long reign. Over these years your character-knight begets a family whose reputation depends on the glory he achieves. He passes his hard-won inheritance and grudges to his sons. Up to four generations of knights will live and die during Arthur’s reign. Game System – Easily remembered, simple-to-play mechanics feature a single die roll to determine combat, to settle personality encounters, and to resolve skill use. Character Generation – create a squire, knight, noble, or fair damsel, of Roman Saxon, Cymric, Pictish, or Irish heritage. Select between the Christian, Wotonic, or pagan religions. Background – Includes a 22″ by 30″ map of Britain complete with kingdoms, cities, castles, keeps, forests, Roman roads, abbeys, rivers, mountains, fortified walls, and battle sites. A bestiary of natural and mythical creatures includes avancs, barguests, dwarfs, elves, giants, kelpies, spriggans, unicorns, yales, and the Questing Beast among many others. You are provided character statistics for major personalities such as Arthur, Guenever, and Lancelot. Also enclosed are lesser-knowns such as Balin le Sauvage, Breuse sans Pitie, Saint Cadoc, King Mark, Nimue, Percivale and Ulfius. A chronology includes wars, adventures, customs, campaigh escalation, and characters of note. An extensive bibliography provides further sources of information, all to support campaign play. Although I’m not playing it right now, Greg Stafford’s King Arthur Pendragon is on of my favorite RPGs ever. Over at Refereeing and Reflection, a post just went up giving a terrific overview of the game by someone who played through a solid chunk of The Great Pendragon Campaign. If you’re not familiar with the game, but curious about it, you might want give the overview a shot. It describes not just the mechanics, but the overview of session and campaign play. The Passions are an extension of the idea of big feelings, big actions. These are characters who MUST take action. When the chips are down (or when a player really wants to spike an action) he or she can invoke Passions for the Player Knight. Loyalty to Lord, Hatred of Saxons, Love of Wife — the whole range of Passions and passions directed at certain groups or specific people are possible. Not only do the Passion rules offer a specific mechanical benefit to Player Knight personalities, but I’ve found they really energize the Players when invoked. Invoking Passions really puts on the line “I really hate theses Saxons! I become almost superhuman when fighting them!” or “My love for my wife will make me ride all day and all knight for five days to return home and save her!” The rolls mark extremes — and again, superhuman — moments of behavior and action that lift the knights out of the mundane and into that realm that approaches Lancelot and Gawain in their deeds, making them worthy characters in a fresh cycle of tales for Arthurian Knights. There are game mechanic limiters on Passions, just as there are for Traits. The GM and Players can make calls for Passions, making moments that say, “This matters!” and go for that mechanical advantage. If a Player Knight is very Passionate about something, and that object is at risk or a threat — or even present! — it means that the Player Knight might take strong action even if it’s not a very good idea. This is all story stuff, these Traits and Passions, marking the Characters as creatures of their feelings and behaviors, not strategic choices and tactics. To fully mark these moments with description and narrative the Players must find within themselves the feelings and actions dictated by the roll of the dice. It is an invitation to feel and go toward places they often never expected to go! This is the activity of the actor or the ritual participant acting out a part that is not them, but that moves them in new and cool ways, opening their experience in a subtle way. It’s reading a book, identifying with a character that is not you and not behaving by the choices you would make, but getting caught up in feelings or choices we often avoid in daily life (for good reason!) but experiencing them safely in the environment of play. It’s Stafford’s view that by meeting up with these larger than life characters and behaviors we take away something very important from the myths we are interacting with. Certainly, in my experience, it’s provided a hell of a lot of fun! A PC gets a value of Glory equal to a Trait value of 16+ each year. If, through the combination of several Traits reaching appropriate values, the Knight attains Religious or Chivalrous ideals, then he gains an extra 100 Glory a year. Glory is the mechanic that Traits directly connect to. Glory is the game’s carrot. Taking Glory out of the equation of as a concern collapses the game. From high Traits to building fortresses to completing scenario quests — each of these and more advances a PC’s Glory. For every 1000 points of Glory, a PC can add 1 point to any Skill, Trait, Passion, or Attribute. The ability to increase an Attribute is important, of course, as Glory is the only method of increasing an Attribute after character creation. Such increases are incredibly powerful for increase the Damage done by a PC, as well as how much Damage he can sustain. But increases to Skills are just as important, as they drive the chance of, of example, a sword strike to being a hit everyone round, and even increasing the odds of getting a Critical strike on a regular basis. And if a Player wants to repair damage to a fallen Trait or Passion (with a point lost due to adventures during the previous year’s play) he can spend the point to raise his Trait or Passion back to a Famous value, or simply raise it because he wants it higher. All of this is to say that Traits feed directly into the mechanics of the game. High Traits provide Glory, which feed into increase of Attributes, Traits, Passions, and Skills. Moreover, the game is designed to be played in a dynastic manner. That is, it is assumed that every PC will die at some point. It is vital that the PC father an heir. And when that PC dies, that heir will become a new PC for the Player to play. Importantly, 10% of the Glory accumulated by the father is passed to son. If the father had already accumulated several thousand Glory, the son is already on his way to gaining additional points in Attributes. Keep in mind that if a Knight as three to five Traits at Famous levels, that’s 50 to 100 Glory additional Glory gained every Winter Phase. If he has Traits that offer Chivalrous or Religious Ideals, he’ll be racking up about 200 Glory every Winter Phase. Over five years of campaign time, that’s another point to be added as a bonus to the character. This is in addition to any other Glory gained for combat, marriage, gaining titles, completing quests and more. Traits matter. Now, one might not think that having Glory as the driving engine of the game is a good idea. One might not like it. One might not want to use it. But to say that Traits don’t connect to the mechanics is incorrect. Only famous traits and passions (i.e., those with a value of 16 or higher) are noteworthy, and such traits or passions must be tested with a die roll whenever character behavior is challenged in a crisis. The Gamemaster should request trait rolls only when a trait is tested in an important situation. In general, trait rolls simulate situations in which a crisis forces the character to act unconsciously. Critical Success An experience check is normally gained, and the character acts strongly in accordance with the trait. Success The character acts in accordance with the trait. The player may decide precisely what action ensues within that limitation. An experience check should be gained only if the action is somehow significant to the story or the character. Failure Roll again, this time against the opposed trait. Success on this second roll means the character acts in accordance with that second trait. Failure indicates the player may choose freely how the character will act. No checks are given. Fumble The opposite trait is checked, and the character immediately acts in accordance with the checked trait. Note that the PC might end up behaving in the manner opposite his Famous Trait. Note, too, that the Player might end up in the position of choosing how is PC behaves even in a moment of crisis with a tested Famous Trait.That is, to have a Famous Trait is a gamble. It is uncertain. This is different, for example, than FATE, where the Players decide when to invoke an Aspect for a bonus, or the Referee invoke an Aspect though Referee fiat. I suspect that for lots of people, this control that the Players have over when to invoke their Aspects is part of the appeal, if not the thing that makes it feel “modern” or better designed.This ties to Stafford’s purpose in designing the game the way he did, and the source material he wanted to emulate. In the fiction (specifically Le Morte D’Arthur, which is the key touchstone for the game), knights are characters with strong, strong feelings. They feel strongly about God. They feel strongly about the women they love. They feel strongly about their lord, their king, their families. They feel strongly about Saxons and bastards who killed their father and whomever else they hate. The Traits mechanics reflect that the Knights of Mallory are characters of behavior. They do not live by the psychological insights that we assume all characters live by in fiction (or we live by in life). They are their Traits: the behaviors the Knights are known for. “Known for” in Pendragon means a score of 16 or more. This nets the Player Knight Glory every year equal to the value of the score. It also means that when the Knight is tested in anyway along these behaviors he will usually react that way. (But not necessarily! GMs botch this rule all the time!) If the Player Knight has a Lazy of 17, he’ll most like be lazy — even if his lord asked him to stay up and keep watch that night on the castle tower. If a Player Knight is Honest 18 he’ll most likely tell the truth — even if it would be to his advantage to lie, even if it means putting someone he loves in danger. Note that both “good” and “bad” behaviors gain Glory at scores above 16. What matters is to have a Trait of behavior so strong, the Player Knight is known for it. To be known is the goal of the game. The game’s reward system is GLORY, not experience, and Glory is the sum total of actions, behaviors, adventures, extravagant expenses, holdings of land and so on… all the things that make a Knight a presence in the world. You get Glory for being knighted as a squire, you get Glory for getting married, you get Glory for being given a holding, you get Glory for being present at the pulling of the Sword from the Stone — you were there! — and that gets you Glory. But the Glory you get comes at the price of being extreme in behavior. We know people who are extreme in behavior, and better or worse, we remember them. These are the kinds of characters Greg Stafford modeled in his rules for the game. Significantly, it means that sometimes the Players are along for the ride with the Player Knights. The enemy of the Player Knight’s family walks into Arthur’s Court, and the GM asks for a Vengeful or Reckless Roll (if the Player Knight’s Traits are high enough to demand a roll), and the Player Knight might very well end up walking right up that family enemy and lobbing the man’s head off — right in Arthur’s court! That’s a terrible breach of conduct, as Arthur (like any lord) promises safety to anyone in his court. So now the Player has a Player Knight who has done this thing! Now what? Arthur might banish the knight. (This happened to several knights in Le Morte D’Arthur for exactly this kind of behavior!) Or the Player Knight might flee! Or the decapitated man’s family might start a blood feud that rages and distracts the kingdom from the threat of the Saxons! Or the Player might have the knight drop to his knees before Arthur and say, “Assign me any punishment for what I have done!” or “Assign me any task to make up for what I have done!” Or the Player might have his Player Knight deliver himself to the hands of his enemies to avoid a blood feud and spare his family. Who knows? The point is that the Player sometimes rides the behavior of the knight like someone riding a wild horse and sees where he ends up. And from there a new set of story elements and problems are derived and we see where we go next. That’s what I mean that Pendragon demands that the Player is both witness and participant to the ritual telling of the tales of these Arthurian knights they’ve created, both audience and story-telling shaman to the tale. The games’ world and events impress themselves into the Player’s experience directly — even the Players’ character, which is usually sacrosanct and off limits in most games. Of course, if the Player makes choices that go against his Famous Traits, the value of that Trait will start to drop as the Referee sees fit. There is another significant aspect to the Traits. By getting high values in a specific collection of traits one can get bonuses for the Player Knight. A specific collection of Traits will get a Player Knight a Chivalry bonus; another collection will get the Knight a Christian Religion Bonus; another will get a Pagan Religion Bonus. Not only do knights who live by these Chivalrous Virtues or Religious Virtues gain an annual Glory bonus, but they get mechanical rewards as well: Chivalric Knights get a constant +3 Armor for example; knights living in accordance with Pagan virtues get a healing rate bonus. This, to me, is an amazing payoff for the Traits rules. You can go for a bonus, but which one? And how will that choice intersect with your Knight in daily and dramatic decisions as he strives to live by ideals when ideals sometimes get in the way of survival, loyalty, love and other ideals? Please note that all of this ties to what others have called, “The game plays you” mode. That is, people don’t like that fact that they can’t just decide what their Knight does if he has a Trait of a Famous value and is in a moment of tested crisis. 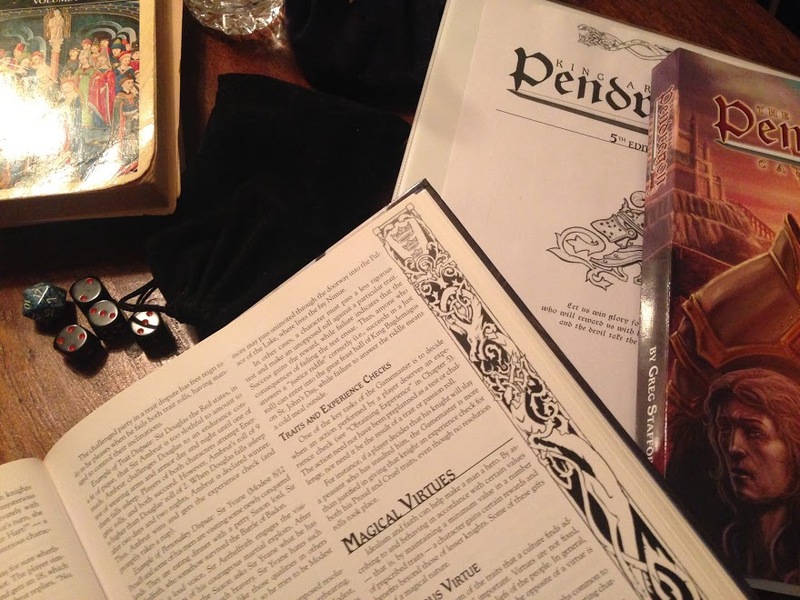 When you have a Player Knight in Pendragon, you can guide him to a degree, but the random rolls of the d20 will lead you to choices and decisions you might not otherwise make. You are responsible to flowing into the character in a way most RPGs don’t expect you to flow, as he leads you on the story you discover by playing a character of such strong characteristics and passions. That is what Stafford wanted to offer to players at the table. Again, this is either appealing or it is not to different people. But it is doing exactly what it was designed to do, with each gear fitting into the next along the way. I think those questions are worrying about the wrong things. Here’s why. I see the game (and I’ve talked about this with Stafford and he concurred) that the game is more like walking The Stations of the Cross in the Catholic Church, if you will. Or, to get less denominational, like the stages of a Hero Quest in HeroQuest. The game asks the Players to sink into the story of Arthur’s rise and fall and experience it as participants who don’t get to change the big story. Now, contemporary audiences are used to T.H. White’s The Once and Future King and the musical Camelot (based on White’s book), and other recent novels that deal with the “primary players.” But Thomas Mallory and the French romances are really inspiration for Stafford’s game. 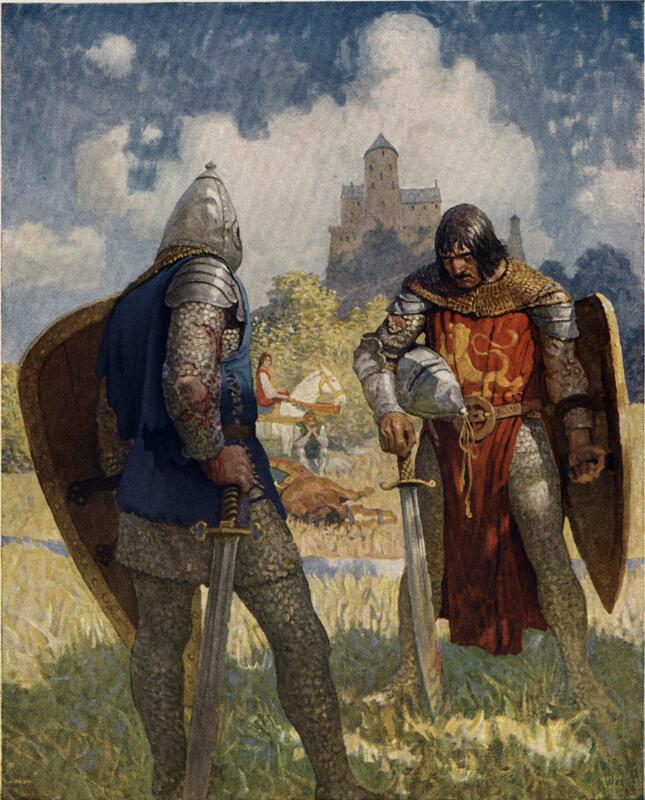 If you’ve had a chance to read Thomas Mallory’s Le Morte D’arthur, you’ll notice, strangely, that there’s a lot of Arthur and Guinevere and Lancelot, but there’s a lot more about a lot of other characters. The book is really a collection of stories about lots of knights, of how they stand in relation to each other and how they stand in relation to Arthur. Seen this way, you and your players are adding tales to that tradition (which I think is an utterly cool and wonderful thing), tales taking place in the foreground of Arthur’s rise and fall. Arthur’s rise and fall and the love triangle take place in the background of the Player Knight’s lives. That’s a huge shift in perspective as people usually think of it, but it’s very important: Arthur isn’t where the action is. Where the Player Knights are is where the action is. In a “metaplot” from most game lines the Players (and even the GM!) had NO idea where the story is going. In Pendragon everyone knows where the story is going. This gives the Players a chance to have their character knights stand in ironic relation to the larger back story of Camelot and Arthur’s rise and fall. This is a HUGE difference. It gives the Players immense creative possibilities to create amazing moments where the choices they make for their knights are fully informed by the story that everyone at the table knows, though their characters do not. Because everyone knows the backstory, there is either complete buy in or there isn’t on the part of the Players. You never reach that moment when Great Uza (or whomever) dies when supplement #14 comes out, and one or more Players go, “What? That blows! Great Uza is why I was playing this game.”) With The Great Pendragon Campaign, what matters is how the Players choose to plug themselves in events that the know are coming. Will they side with Lancelot or Arthur when the split comes? Well, that’s something to anticipate and plan toward — not be surprised by later on. There are no railroad tracks. Unlike most metaplot games, where the GM has to keep tearing up and laying down new tracks to make sure the Players don’t get to far afield of what’s really going on, what’s really going on in Pendragon is the lives of the Player Knights. It’s like setting a story against the back drop of World War II and having the Player Characters be the GIs working their way across Europe. Sure, someone might say, “Hey, If your not playing Churchill, Stalin and Hitler, what the hell’s the point?” But most folks can see how playing those GI will be full of drama even if the GM sticks the events of history and the PCs make choices and live out their lives within that drama. But this works in The Great Pendragon Campaign (maybe counter-intuitively) because all the facts and history are known. In most of the metaplot games, the uber-NPCs really could move and shake everything the PCs had been doing into useless shambles because who the hell knew what the game company was going to publish next month. And the metaplot really was about the Churchill’s and Hitlers of the game world. In Pendragon all the stuff of the Arthur and Camelot and the love triangle is a given. Okay, then — that’s that that’s a given, what is left to explore and discover? The lives of the Player Knights! So, I wouldn’t want the Players to replace the famous knights — though it’s certainly possible they’ll be sitting alongside them at the Round Table. The story that matters, however, is the story of the Player Knights, a new cycle of tales of men and women caught between the tension of inspiring ideals and grounded realities; the stories of how they conducted themselves as citizens, warriors, lovers, fathers and servants of a king in a land of god, war, fairies, and family. I’m part of a local Meetup established to play games the gang hasn’t played yet. Last time we met I offered to run King Arthur Pendragon. Everyone had such a good time they insisted I run another session. I had planned to introduce the Battle System (from Book of Battles2nd. Edition). But a new player jumped in tonight, so I decided not to dump them into that. Despite the doubts, the Knights triumphed — though they sat despondent and broken on the fields near a forest where they cut down the Saxons. As night fell they saw strange lights glowing beyond the forest’s edge. Curious and afraid (of more Saxons) they made their way closer with guarded care. As they approached they heard strange and beautiful singing as the lights became floating colors both unearthly and appealing. Three of the Knights stopped at the edge of the trees, afraid to go any further. The fourth made his way closer — seeing a Fairie feast in progress, where beautiful creatures wearing spider thread silks sang and danced. Six Saxon warriors stacked on spikes cut from sharpened tree branches stood at the feasts center. A fairie child approached him, holding out a scone on her hand. He hesitated, drawn by the sweet’s appearance. But famed for his Temperance, he resisted, backing away. The knights found shelter for the night. Finished their patrol of the county over the next week. Returned to Sarum to tell everyone of what befell them. Glory was gained. Two of the Knights each found a bride. A child was born. I walked them through the Winter Phase and the dynastic elements so they’d have a good idea of how the game works and how all the pieces work together. As we were wearing up, one player looked over at another player’s character sheet asking, “How much Glory do you have?” So, yeah. They fell for it hard. It went down like gang busters.